Calderdale Council and the Halifax Business Improvement District (BID) have worked together to commission four new cycle storage facilities in the town. 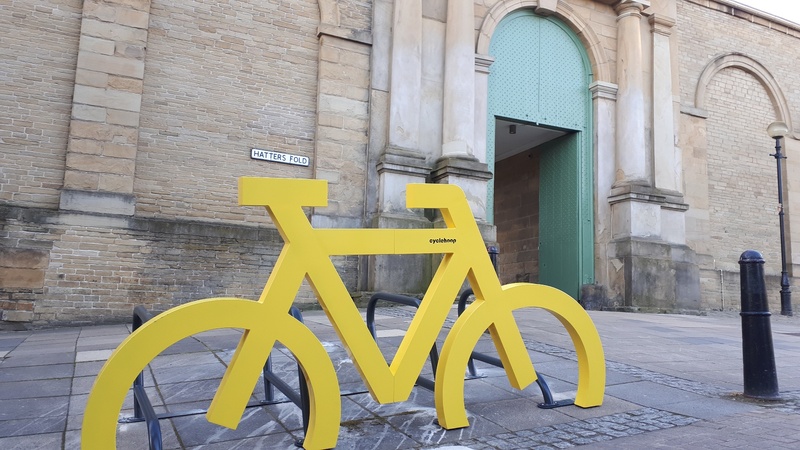 The colourful storage racks each have space for up to eight bikes and will be in place in time to celebrate the final stage of the Tour de Yorkshire starting from The Piece Hall on Sunday 5 May. The new facilities are located at The Piece Hall, Old Market, Southgate and George Square. These locations have been chosen as some of the most convenient places for cyclists..
“These new cycle storage facilities will provide a convenient place for people to leave their bikes while visiting the town centre and will complement the many other cycling infrastructure improvements taking place across the borough. To find out more about investment projects that are helping to transform and regenerate Calderdale, visit www.calderdalenextchapter.co.uk(external link) . Follow #CdaleNextChapter and #ActiveCdale on social media for all the latest updates. This entry was posted in Cycling, Next Chapter, Transport. Bookmark the permalink.